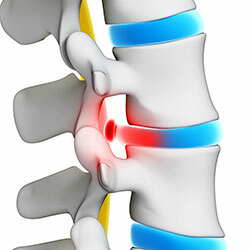 The spinal disc is a soft cushion that sits between each vertabrae of the spine. The spinal discs are composed of a tough outer cartilage (annulus fibrosus) with a squishy center (nucleus pulposis). Like a shock absorber for a car, the disc is the shock absorber for the spine. When too much pressure is placed on the disc, it bulges or herniates. Think of it like a jelly doughnut. Squeeze it too hard and the jelly comes out. That is called a Herniated Disc (Slipped Disc, Bulging Disc). The discs cushion the spine from compressive forces, but are weak to pressure applied during rotational movements. That is why a person who bends to one side, at a bad angle to pick something up, may more likely herniate a spinal disc than a person jumping from a ladder and landing on his or her feet. Herniation of a disc occurs when the liquid center of the disc bulges outwards, tearing the external ring of fibers, extruding into the spinal canal, and compressing a nerve root. This extruded liquid from the nucleus pulposus may cause inflammation and swelling of surrounding tissue which may cause further compression of the nerve root in the confined space in the spinal canal. What causes Symptoms of a Herniated Disc? When the herniated disc ruptures and pushes out, the nerves may become pinched. When a herniated disc occurs, the space for the nerves is further diminished, and irritation of the nerve results. This irritation of the nerves going down the arms or legs can lead to the characteristic signs of a disc herniation including but not limited to shooting, electrical pain down the arms and legs and numbness and tingling in the hands and feet. How does Spinal Decompression help a Herniated Disc? Non-Surgical Spinal Decompression slowly lengthens and decompresses the spine, creating negative pressures within the discs. This reversal of pressure creates a vacuum inside the discs that helps to reposition bulging discs and draw extruded disc material back into place, taking pressure off pinched nerves. Spinal experts believe that nutrients, oxygen, and fluids are drawn into the disc to create a revitalized environment conducive to healing. Degenerative disc disease is not really a disease but a term used to describe the changes in your spinal discs as you age. Spinal discs are soft, compressible discs that separate the interlocking bones (vertebrae) that make up the spine. 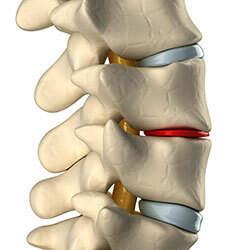 The discs act as shock absorbers for the spine, allowing it to flex, bend, and twist. Degenerative disc disease can take place throughout the spine, but it most often occurs in the discs in the lower back (lumbar region) and the neck (cervical region). Tiny tears or cracks in the outer layer of the disc. The jellylike material inside the disc (nucleus) may be forced out through the tears or cracks in the capsule, which causes the disc to bulge, break open (rupture), or break into fragments. These changes are more likely to occur in people who smoke cigarettes and those who do heavy physical work (such as repeated heavy lifting). People who are obese are also more likely to have symptoms of degenerative disc disease. A sudden (acute) injury leading to a Degenerative disc (such as a fall) may also begin the degeneration process. Degenerative disc disease may result in back or neck pain, but this varies from person to person. Many people have no pain, while others with the same amount of disc damage have severe pain that limits their activities. With symptomatic degenerative disc disease, chronic low back pain sometimes radiates to the hips, or there is pain in the buttocks or thighs while walking; sporadic tingling or weakness through the knees may also be evident. Similar pain may be felt or may increase while sitting, bending, lifting, and twisting. Chronic neck pain can also be caused in the upper spine, with pain radiating to the shoulders, arms and hands. Where the pain occurs depends on the location of the affected disc. An affected disc in the neck area may result in neck or arm pain, while an affected disc in the lower back may result in pain in the back, buttocks, or leg. The pain often gets worse with movements such as bending over, reaching up, or twisting. How does Spinal Decompression help Degenerating Discs? While lying comfortably on the spinal decompression table, gentle specialized traction forces are applied until decompression is achieved. Decompression produces a negative pressure inside the discs that acts like a vacuum. This negative pressure produces an influx of fluid and minerals which helps the discs to heal. Then with the addition of specific nutrients and minerals through supplements, the influx helps the discs to heal, become more flexible, more hydrated and even taller. As disc bulges or herniations are drawn in, or as the discs begin to regenerate, pressure is taken off of the nerves and surrounding structures relieving the patient of pain and decreasing inflammation. Sciatica is pain associated with the sciatic nerve which usually originates higher along the spinal cord when nerve roots become compressed or damaged from narrowing of the vertebral column or from a slipped or herniated disc. Symptoms can include tingling, numbness, or pain, which radiates to the buttocks, legs and feet. The Sciatic nerve is the main nerve traveling down the leg. This nerve starts in the spine and runs down the back of each leg into the feet. This nerve controls the muscles of the back of the knee and lower leg and provides sensation to the back of the thigh, part of the lower leg, and the sole of the foot. Piriformis syndrome — The piriformis muscle, located in the buttocks, becomes tight and or spasmed and irritates the Sciatic nerve. Slipped Disc, Herniated Disc, Bulged Disc-A herniated or bulging disc can push out (like squeezing the jelly out of a jelly doughnut) and irritate the nerve root of the sciatic nerve causing sciatica. What does Sciatica Feel Like? Sciatic pain can vary widely. It may feel like a mild tingling, dull ache, or a burning sensation. Some patients describe it as a hot poker or a shooting electrical pain in the buttocks and down the leg. Often times the pain will shoot down the leg into the foot and have accompanied numbness and tingling in the leg and foot. In some cases, the pain is severe enough to make a person unable to move. The pain most often occurs on one side. Some people have sharp pain in one part of the leg or hip and numbness in other parts. The sensations may also be felt on the back of the calf or on the sole of the foot. The affected leg may feel weak. It is always important to consult a qualified physician to determine the cause and best course of action for your sciatica. Success of sciatica treatment is determined by the ability of the physician to determine the exact cause of the sciatica and have the tools necessary to treat that underlying cause. What are My Options for the Treatment of Sciatica? Your doctor may prescribe different therapies depending on the cause of sciatica. Often times stretching, ice and rest are enough to allow the pain and inflammation associated with sciatica to self resolve. If pain persists longer than a week or two then your doctor may recommend spinal decompression. How does Spinal Decompression help Sciatica? At the beginning of each session, you will be comfortably fitted with a harness designed to achieve optimal decompression of the low back or neck. During a session of spinal decompression, you will notice a slow lengthening of your spine as your discs are gradually decompressed and relieved of pressure. The treatment process is safe and relaxing. 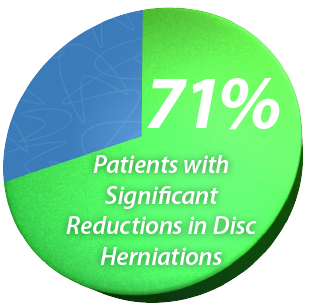 While some patients with extensively injured discs have reported mild discomfort during the first few treatment sessions, their discomfort generally subsides upon subsequent visits. A patient safety switch provides an extra safety feature, allowing you to stop at any point should you feel discomfort. Each treatment session lasts approximately 30 minutes. Individual patient results may vary. A typical spinal decompression treatment protocol consists of about 12-20 sessions over four to six weeks. Some conditions require fewer visits; some require more. Many patients report relief from their pain and other symptoms during the first few treatment sessions, and most experience dramatic pain relief after completion of their prescribed treatment program. Why Is Spinal Decompression Different from Traction, Physical Therapy and Chiropractic Manipulation? While traction, physical therapy, and manipulation may reduce disc pressures to as low as 40 mm Hg, only spinal decompression has been shown to achieve negative pressures within the spine. It has been clinically proven that spinal decompression creates negative pressures as low as -110 mm Hg3 within the injured disc during the treatment session. Normally, pulls exerted on the spine trigger sensory receptors in the back to tighten the muscles surrounding the vertebrae and discs in an effort to protect them from injury. Spinal Decompression bypasses this response by slowly pulling on the spine and relaxing the back over an extended period of time, allowing the spine to be repositioned without tension and without causing spasm and muscle guarding. It is important for patients to make sure that they are treated on a high quality true spinal decompression table by a physician with years of experience and not an imitation spinal decompression table. Is it true that research has shown up to 88.9% success rate for spinal decompression? Multi-center, phase II, non-randomized pilot study utilizing spinal decompression. Designed to evaluate the effectiveness and safety of spinal decompression in the treatment of chronic lower back pain. Patients enrolled an average of ten years of chronic back pain. After two weeks of treatments of spinal decompression – 50% reduction in pain scores. Upon completion of the entire six week protocol success rate of 88.9% was documented. Is it true that professional athletes, celebrities and patients in their 90s have turned to Spinal Decompression and Cold Laser Therapy as a successful, non-surgical option to neck and back pain without the use of drugs, pills and surgery? Yes! Professional athletes, celebrities and even patients in their 90s are turning to spinal decompression and cold laser therapy as an affordable, non-surgical alternative to neck and back pain without the use of drugs, pills and surgery. People are tired of taking pills that simply mask the pain and can cause all kinds of serious side effects. People are frustrated with getting shots that work the first time or two and then eventually have minimal or no effect. And people are scared to death of surgery as they have seen firsthand their friends and relatives who spent 1,000s of dollars, had weeks of down time, have scars, and risked serious side effects and still ended up with a failed back surgery syndrome. New non-surgical spinal decompression is not only effective and affordable but is also non-invasive and safe. When I started this program, I had burning, stabbing pain down my right leg and numbness and tingling in my foot. Doctors told me I had Sciatica complicated by Degenerative Disc Disease. I tried chiropractic and physical therapy with only minimal relief. Sometimes the physical therapy actually made it worse. After beginning the spinal decompression treatments ... the pain is now gone. My back was always sore and stiff. Now it feels much, much better. Overall, this program worked wonders for me and I hope it will for everybody. My back used to hurt all day, everyday. Doctors told me I have Degenerative Disc Disease. Thats when I saw an ad for spinal decompression and deep tissue laser therapy .... After my second treatment, I could get out of bed in the morning with no pain. Three weeks later I am pain-free! Thank each and every one ... for making my life better.